As anyone who’s made my acquaintance will know, I love tequila. Not that mixto crap that frat boys pour down coeds throats, but the good stuff. The 100% agave azul stuff. Sipped neat, without the lime, without salt. I love it all, from the young blanco’s with their intense agave flavors to the reposadas and añejos with the mellowing flavors of the barrels they’ve rested in. For this reason, I have always resisted doing a post on the margarita. Well, the time has come. My Beer Trail riding in-laws have come for a visit and the drug cartels have finally loosened up a bit on the price of limes, so I thought it was a good afternoon for a pitcher of magaritas. I never really thought that margarias were a particularly historic cocktail. I always figured they were a product of the Jimmy buffet-droning, blender-whirring, offensively-named (think about it) fake cantinas that litter the midwest (did I mention that I used to work at one). Turns out though, I was wrong. It’s history, like all good cocktails, is shrouded in legend, most of which are demonstrably wrong. By 1945, a recipe appears in a Jose Cuervo ad, so stories of a socialite inventing it in 1948 are out. Smithosonian Magazine even devoted some effort to the archeology of the margarita. Their best guess is a bartender named Carlos “Danny” Herrera came up with it in 1938 in his Tijuana restaurant. Shake well with ice and serve in a salt rimmed glass. Since I also had grapefruit juice, I used the same recipe with Cazadores Blanco tequila (again, never a mixto) and 1/2 oz each of lime and grapefruit juice. I also added crushed ice to the glass to keep everything nice and cold. It is a refreshing way to while way an afternoon. 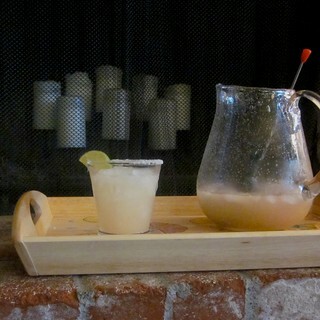 Carlos “Danny” Herrera developed the drink at his Tijuana-area restaurant, Rancho La Gloria, around 1938.